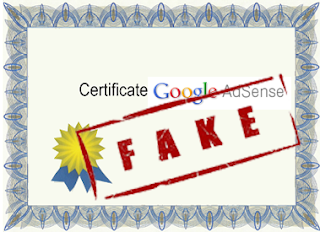 Don't Be Fooled By Fake Google AdSense Certification Programs! Wouldn't it be nice if you get a certification for Google AdSense? You'd then be working for Google! Google is considered as one of the best employer in the world to work with. But sadly, this isn't possible as yet, as some of the fake certification programs would have you believe. A lot many programs in various countries have opened up promising you a certification for Google AdSense, in return for an initial setting-up fee. have even seen classifieds in local newspapers in my own country promising similar things. Pleasing as they sound, be ware of such programs though! Do not sign up with any. They are nothing but frauds, merely extravagant ways of picking people's pockets. Such programs take your money and then completely ignore you, or provide lame excuses for not being able to complete your certification. You want proof? Google themselves say that there is no such Official AdSense Certification program. As you may know, the AdSense team is always looking for ways to improve the program for our publishers. Today, we’d like to take a moment to clarify that there is no official Google AdSense certification program. Please know that Google has not licensed outside professionals, agencies, or any other individuals such as search engine optimizers (SEOs) to manage AdSense accounts or become AdSense consultants. Additionally, Google has not authorized any third party to sell AdSense accounts in any country and therefore, we highly recommend that you refrain from signing up for these misleading schemes. Some of you might be disappointed, but better be informed than be ignorant and lose money to some frauds. You can, however, use Google's online resources to know how you could increase your AdSense income. AdSense Help Center - Learn more about AdSense policies and guidelines, and get answers to most common questions. AdSense Blog - Stay tuned to AdSense blog and get the latest AdSense news, tips and updates. AdSense Policies - Learn everything you need to know about AdSense policies so that you don't find yourself in a sticky situation. AdSense Help Forum - Answer questions and share your knowledge with other people at Google AdSense Help Forum. Lost Adsense? How to get it back? yes, and the second thing is adsense account approved through third party sites like hubpages are being banned after a month or so because they recognize that the account approval trick was used just to place ads on other blogs. so try to apply through your own blog. cheers. yeah of course thanks for info. Yeah Qasim i was also Fooled 3 years ago when I started my first blog which was only based on copieng and pasting materials of other sites. Then a person "I will not mansion his name here" told me can I see your log i told him my url he said wow awesome Blah blah blah ( just buttering ) and told me hey why you are not using AdSense i told him that bro adsense is not for my site because i am using copied materials he said no no you can earn alot from here. So I decided to to apply for AdSense but rejected thrice times, I contacted that person and he said I will give you account for just 300 Pakistani Rupees I said wow it is free haha. But unfortunately My Account wass banned with in few days and He ran away and took my money...!